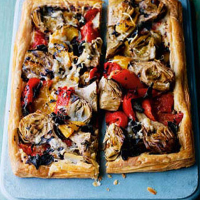 This is a quick and easily varied tart; deli-style grilled artichokes and peppers are a luxurious cheat but you could grill your own, and olives, roasted veg and sun-blush or fresh tomatoes would all make admirable substitutes. The Menorcan cheese in this recipe is named after the town of Mahon, whose salsa mahonesa is thought to be the original mayonnaise. Preheat the oven to 190˚C/gas 5 and place a baking sheet in the oven to heat up. Roll the pastry out to form a rectangle, about 20cm x 30cm, and trim the edges. Transfer the pastry to a sheet of baking paper. Score a line along each edge, 1cm in, to form a border; spread the inner rectangle with tapenade. Sprinkle with a little cheese, arrange the remaining ingredients on top and scatter with the remaining cheese. Carefully transfer the tart, on its paper, to the hot baking sheet and cook for about 20–25 minutes, until golden and puffed at the edges.